On Sunday July 14th, 2013, Reverend Tony Ponticello addressed the assembled congregation at the Community Miracles Center's San Francisco facility. What follows is a lightly edited transcription of that lecture. The title of my talk today is, "Criticism, Cults, and Socrates." I'm actually going to be talking a lot about the Community Miracles Center. The CMC, Community Miracles Center, was not founded as "Community Miracles Center." It was actually formed as "California Miracles Center" in 1987. We existed as California Miracles Center for eleven years. However, in 1998 things were changing. The internet was coming into the fore, and we already had a lot of outreach to people throughout the country through our publication Miracles Monthly. By 1998 we were having substantial outreach to people all over the world through the internet. I was seeing that geographically limiting ourselves with our name was probably not a good idea. We had to come up with another name, and the name "Community Miracles Center" just came to mind. It was right there. Holy Spirit gave me that idea, immediately, the first time I asked. It seemed perfect because we were an A Course in Miracles community. We had a strong focus on communitarian values, and it was great because our initials, and our logo, could stay the same. We were still CMC regardless, not that much had to change. However, let me tell you, changing a business name legally is always complicated. There's a lot of paperwork, a lot of stuff you have to do, a lot of agencies have to be notified. It created problems. There's still some agencies that refuse to acknowledge our new name. We are now, legally since 1998, Community Miracles Center, and that community idea is very important for us. If you come here, (Rev. Tony looks through the congregation) and all of you do come here frequently, then you know that we are a community. There is the community of ministers that speak. I'm not the only one who speaks. Many speak, there are eight regular speakers now, and sometimes there are even other speakers, special speakers. We have special services every once in a while named "Community Voices" where many different people come up from the community to speak. We have Miracle Shares where different people come up and share things. So we really are a community. On the internet we have our community blog, the MOLDG, the Miracles On Line Discussion Group. Everybody in the community can participate in that, and do. We have a Facebook group that people share and communicate on. They share how they are interpreting A Course in Miracles. They share how they're applying A Course in Miracles principles to their lives, and we have a great deal of latitude about that. I think we're actually amazingly open about all of this. The truth is there is no A Course in Miracles interpretation authority figure at the Community Miracles Center. We always have left the Course interpretation to the individual, how they interpret and how they apply the material is personal. Certainly, the ministers get up here, speak, and talk about how they apply, and how they interpret, but that is just a way of giving an example. How anybody applies and interprets A Course in Miracles is between them and the Holy Spirit, and perfectly appropriate to be communicated and hopefully accepted. At least that is our goal. This is actually something that's unique in ACIM circles, because most ACIM organizations have authorities connected with them who interpret. That's fine, it is just not what we do. It's never been our focus. We have always had that interpretation function more open. As such, people can actively disagree with each other, and they certainly can disagree with me, and people do actively disagree with me. If you follow the MOLDG, if you ever read it, you'll see that people very strongly disagree with me at times. They challenge me and criticize me. We have always been open to that. We try to put out there, that we would like the criticism and challenges to be respectful, and I think 95% of the time they are. Every once in awhile something gets a little out of hand, but that's really pretty rare. Our community blog, the MOLDG, is a very unique thing. It's actually a bit of a fossil as far as internet blogs go. It's very old technology, and there's many more modern, higher tech, ways to do what we do with a blog than what we use. But I always remember that the MOLDG was formed sixteen and a half years ago. It's a sixteen and a half year blog. It's probably the oldest A Course in Miracles blog on the internet. It's been functioning consistently for all these years. I think it's pretty amazing that it's still there, that people still post things. People still challenge me on it, and each other, and sometimes people get a little upset. But I always encourage people on the MOLDG not to be thinned skinned. If somebody disagrees with you, it's fine. Disagreement is fine. Accept it, and hear what they have to say. Respond. If somebody asks you a question, hear what they have to say. Answer it. Try not to take it personally. I would say the number of times that the MOLDG has gotten out of hand ... I could probably think of three times maybe, in the sixteen and a half years, that we've had a little problem. Every time that happens we think, "Maybe we should establish rules and guidelines about how to post." We have sometimes moved in that direction, but then we've let it go. It just seems too arbitrary, too authoritarian, for something that happens so rarely. Do we really need these hard rules about how to participate? I think the same thing is true with our Facebook group. We just don't have those kind of rules, and we encourage people to ask questions, to challenge, and actually to criticize. These thoughts have all been triggered, for me recently, because I participate in many A Course in Miracles groups, not just the ones that we sponsor. I like to see what other Course students are doing. Part of my mission, my function, is to be accurately aware of the greater A Course in Miracles community, so I want to get involved with other discussion groups, other Facebook groups, that have to do with ACIM. I've been involved with a new one recently. The moderator added me to her group. I didn't ask to be a member of her group. She was a Facebook friend of mine. I didn't know who she was. All of a sudden I was a member. If you know how Facebook works, people who are your friends can easily add you to groups they form. They don't ask you if you want to be added. They just add you, and then you start getting messages from that group. For me, there's a little knee jerk reaction. I think, "I don't want to be a part of this group." But – I try to be open, "Well, somebody wanted me as part of their group. I can be open to it, see what's going on." It always amazes me when that happens. (laughter) I don't know how that happens. I'm just going along, just posting, trying to be ... just being me, and I got kicked off the group. I got kicked off, specifically, because I challenged the moderator on something. Apparently, though it's not stated, it is not okay to challenge the moderator. The moderator was not okay with being challenged, and she kicked me off the group. I was not disrespectful. I was very careful that I didn't promote any of my own activities. After that, I was functioning within those rules and occasionally posting. When I referenced a quotation from A Course in Miracles, I referenced the Original Edition which is the edition of the book that I tend to reference when writing. Then, I was told that I couldn't reference the Original Edition anymore, even though I had been doing it for several weeks already without anyone saying anything. The moderator told me I only could reference the Foundation for Inner Peace (FIP/FACIM) edition of the book. Again, I said, "It doesn't say that anywhere. How am I supposed to know that? If you've got a rule, you're supposed to state it." So she said, "Okay. We will state this rule because when you reference other editions, it confuses people." That did something to me, because I had heard this line of reasoning before, that referencing other editions of A Course In Miracles confuses people. In fact, a year and a half ago, we published an email exchange in Miracles Monthly. (See:Vol.25,No.11/Jan.12) The exchange was between me and a prominent ACIM teacher in England who challenged us here at the Community Miracles Center. See, we allow challenges and criticism. We even print them when they come in. He challenged us for quoting from other versions and writing articles about these other published versions. He said the same thing, "It confuses people." However, I challenged him on that. I mean, who are these people who are confused? I don't know them. (laughter) Nobody's ever demonstrated that to me, that quoting from a different version confused them. Mainly, because I don't think anybody ever goes back and reads the quotes from the books. (laughter) I mean, it is just referencing. It shows readers that your quotation comes from source material. I don't think anybody goes back to look at the source material. Maybe there is somebody, but I think it is very, very, very few people who go back to the source material whenever you quote something. A quotation reference just proves that you're quoting something. It has become a euphemistic thing to say, especially for these people who advocate only the FIP/FACIM version of A Course In Miracles and the interpretation of only certain, specific interpreters. They are prone to say that talking about other versions of the book "confuses people." So I challenged the Facebook group moderator, just like I challenged the ACIM teacher in England, on that. I asked her, "Who are the people that were confused? Did somebody express confusion to you? Nobody posted anything about being confused. I didn't read any post stating, ‘I don't know what version Tony is referring to here, and that's confusing me. What's Tony talking about?'" And for that .... That's what I did. I said, "Who was confused?" That's why I got kicked off that group. (laughter) It came as a big surprise. That's what I said. Was saying this really that bad?" That was me challenging her authority, asking her a question. See, I asked her a question, because I wanted to get in a dialogue. Maybe she could see the idea, knowing of different versions of A Course In Miracles confuses people, wasn't actually based on anything. Perhaps she would see that it was just an unfounded, negative idea many people have gotten attached to. The fact that so many people different people use the exact same phrase is suspicious to me. It sounds practiced, rehearsed. It doesn't sound like an original idea. 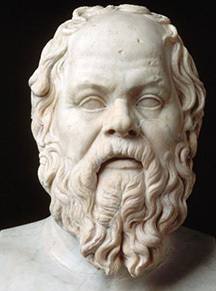 Questioning people's ideas, judgments, and beliefs in an attempt to have a dialogue and come to a greater truth – that's the Socratic method. That's the method the ancient Greek philosopher Socrates championed. We shouldn't just accept beliefs; we need to continually challenge beliefs. Firmly entrenched beliefs and values have to be continually challenged, never accepted. You have a dialogue with people. You ask questions, and you answer questions. You're open to being asked questions, and you're open to answering them. Following the story through, I eventually had a private communication with the moderator. You can, of course, send messages in Facebook privately. I apologized and said that I really didn't know her protocol. I told here "In groups which I'm involved in we do this all the time. I wasn't aware that this kind of posting wasn't appropriate. I certainly didn't mean to offend you." She said as long as I would make an agreement that I would never, never criticize her, or their revered teacher, and that I wouldn't quote or even mention another version of A Course in Miracles, she would reinstate me to the group. Of course, I couldn't promote any of my own material, or work, or group, or workshop, or conference, or anything like that. As long as I would agree to all of those things then she'd let me back in. I just thought, "Recognize what does not matter, and if your brothers ask you for something ‘outrageous,' do it because it does not matter." (OrEd.Tx.11.27) I said, "Sure, no problem." I also said, "But you keep adding rules. So please, what I ask you is that if you add a rule, don't assume I know it until you've communicated it to me, because it's really not my agenda to cause problems. If you keep adding rules, I need to know what they are." So we made that agreement and now I'm back in the group. But it's so restrictive that I don't .... (laughter) I don't know how much I can really participate. (laughter) But, anyway I'm there. (laughter) (As an aside)I think I'm just a simple guy trying to participate and they kick me out. Socrates – the Socratic method – asking questions – this is from Wikipedia, "The Socratic method named after the classical Greek philosopher Socrates, is a form of inquiry and discussion between individuals, based on asking and answering questions to stimulate critical thinking and to illuminate ideas. It is a dialectical method, often involving a discussion in which the defense of one point of view is questioned; one participant may lead another to contradict himself in some way, thus strengthening the inquirer's own point." That's what it is. That's what I was trying to do. It's Socratic. You ask questions. You challenge them, and this is done in the spirit of getting to a greater truth. We, the Community Miracles Center, are definitely open to that. That's why we have discussion after the Sunday lecture each week. Rev. Judy said last week that this is one of the reasons she decided to come back to the Community Miracles Center after her first visit over 23 years ago, because she saw that after the lecture there was discussion, and she liked that. We can be questioned. I also want to remember that eventually Socrates was tried and executed (laughter) by the Athenians. I guess things can go too far. He was 71 at that time but .... We have to take these ideas in a total framework. So while we're in the space-time illusion, while we're here in our physical lives, we are supposed to question and be engaged in the process of challenge and response. We question so that the future may be better than the past. In relation to Community Miracles Center, our continuing place in the A Course In Miracles community, and our evolution, I definitely want to put it out there that it's perfectly okay to question us. Not only is it perfectly okay, it's actually encouraged. Question as much as you want. Challenge as much as you want. Criticize as much as you want. Please try to be respectful in all of that, but I understand that there's a fine line and emotions get triggered. Nobody's going to be perfect in this, but we are not that thinned-skinned. So many in the ACIM community get so sensitive ... like you can't do anything that might offend someone. But me, Rev. Tony, I'm not that thinned-skinned, and I don't think our ministers here are that thinned-skinned either. Try to be respectful. If you slip a little every once in a while we'll try to handle that. The times when it's gotten out of hand have been so few and far between it really doesn't pay to try to create any defensive rules about them. One of the things that successful corporations and businesses talk about, it's in the business world, is corporate branding. What is your brand? What does it mean in the marketplace? What does Community Miracles Center mean in the A Course In Miracles marketplace? I engage myself in that question a lot. I believe one of the things that distinguishes CMC from other ACIM organizations is that you really can criticize us. We are truly open to a whole variety of points of view. You can dialogue with us. You can ask us questions. There is no authority on interpretation here. Challenge, criticize – it's actually encouraged, because it's seen as something that's positive. It's the Socratic method. It will lead us to a greater truth. Of course, don't be surprised if we challenge you back. As I said, there is no authority on A Course in Miracles interpretation here at the Community Miracles Center, because we believe that the only authority for interpretation is each individuals connection to the Holy Spirit for themselves. That's the only authority there is for ACIM interpretation. You can ask our ministers what they believe, and they will tell you, but that's always just as an example, so you can go within and find out what your own beliefs are. However, there's another reason why we encourage criticism. It's because to deny criticism, or to block it, is how cults are formed. (laughing) That's how cults are formed. You set up an authority, you don't allow criticism. Cults always have a group of people that are very insular, and they really only connect with each other. They get all of their social support from each other, and if you criticize them, then they push you out of the group. Getting excluded from a group, that you've bonded so strongly to, is painful. Nobody wants that, and so people learn to toe the line. People learn that criticism is not allowed. If they do criticize – they will get expelled, and they don't want to be expelled, because they want the social connection and the interaction. That's how cults form. The Community Miracles Center is not cultish, and we certainly don't want to be cultish. So we are definitely open to criticism, challenging, and questioning. I'm back on that Facebook group now, and I still look at it occasionally. I did share a little yesterday, and I guess I was okay. They didn't kick me out. I wonder, what is of value for me there? But I'll stay. I'll try to engage, because these are nice people, dedicated students, and I want to be part of them too. Somebody made some outrageous requests. I'll see if I can oblige and stay within that framework. It'll be a challenge. There are many ways Community Miracles Center distinguishes itself. There's many unique things about this particular brand of A Course in Miracles organization. I don't talk about them a lot. I do mention them every once in a while. Usually people say, "We don't need to know that." or "Yeah. Okay. I don't even know why you're mentioning that." However, I think it is important for us to understand who we are, what we stand for, and how we're distinct and different. One of the things is we are open to questions and criticisms, and we certainly don't want to move in the direction of any sort of cultish behavior. Another thing is we practice full disclosure. We practice the most full disclosure of any ACIM organization I know. All our financial records are published. They're all posted on the internet. You probably don't notice it, but when you walk up the stairs, right before you walk through the meeting door, on the left, there are our financial statements. You can always pull our latest financial statements out and look at them. I won't look at you suspiciously if I see you grabbing a financial statement. There's also the minutes of the latest Board of Directors meetings there too. You can always look at those too. Not only that, you don't even have to pull the paper copy. They're all on line. You can go to our website, click Board Minutes, click Financial Statements. They're all there. We practice very, full disclosure. There's advantages for us to do that. One thing, it keeps us having printed minutes and making sure that our account books balance. That's just good business practice. Another thing is it creates that understanding and energy that there's nothing clandestine, nothing hidden. There's no hidden agenda going on. Again, that helps. We really aren't cultish here. Some people may accuse us of that sometimes, but it's really not true. We see ourselves as part of a world wide community of A Course In Miracles students and ACIM organizations. Other organizations handle themselves differently. That's fine, but we are a particular experiment, and a particular brand, with all that we do: the MOLDG, our Facebook groups, our Conferences, Sunday Service, Miracles Monthly, ACIM classes, with everything we do. Those people who appreciate that, understand that, connect with that, will find us. Those are the people who become Supporting Members of the Community Miracles Center. They have found us. For twenty-six and a half years this incredibly interesting experiment of running this kind of organization has succeeded. It continues to succeed, and for that I am very, very grateful. This article appeared in the July 2013 (Vol. 27 No. 5) issue of Miracles Monthly. Miracles Monthly is published by Community Miracles Center in San Francisco, CA. CMC is supported solely by people just like you who: become CMC Supporting Members, Give Donations and Purchase Books and Products through us.